Get ready to devour America. 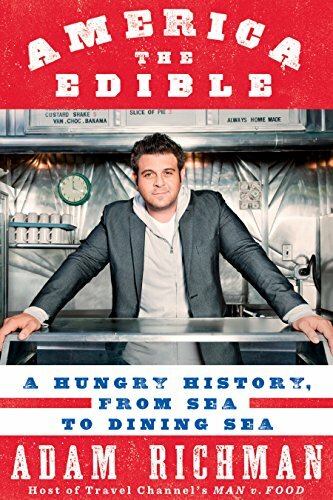 Adam Richman, the exuberant host of Travel Channel’s Man v. Food and Man v. Food Nation, has made it his business to root out unique dining experiences from coast to coast. Now, he zeroes in on some of his top-favorite cities—from Portland, Maine, to Savannah, Georgia—to share his uproariously entertaining food travel stories, top finds, and some invaluable (and hilarious) cautionary tales. America the Edible also tells the story behind the menu, revealing the little-known reason why San Francisco’s sourdough bread couldn’t exist without San Francisco’s fog; why Cleveland just might have some of the country’s best Asian cuisine; and how to eat like a native on the Hawaiian island of Oahu. Unflaggingly funny, curious, and, of course, hungry, Richman captures the spectacular melting pot of American cuisine as only a true foodie and insatiable storyteller can.